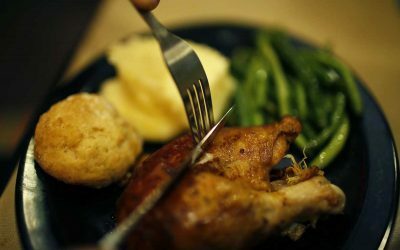 Aramark, the second largest foodservice provider in the United States and the provider of poultry to campuses across the country, including Boston University, made its way into the national spotlight recently, as an online petition against Aramark has garnered more than 70,000 signatures over the past two weeks. The petition is part of a campaign led by The Humane League, a nonprofit organization that works to better the treatment of farm animals. The campaign is working to combat alleged abusive treatment of chickens at Aramark, said Taylor Ford, the corporate campaigns manager at The Humane League. Ford said the League reached out to Aramark six months ago, and, after receiving no response, decided to take their campaign public. The petition calls for Aramark to adopt a meaningful animal welfare policy that spares chickens from the abuses they currently endure in the company’s supply chain. Aramark’s animal welfare policy states the company is looking into these issues, but Ford said that the policy has no actionable items, nor does the company have any timeline to implement the policy. The campaign has three major demands: enriching chickens’ environment with natural light and reduced stocking density, moving to slower growing species of birds to eliminate injuries caused by excessive growth and transitioning from live-shackling slaughter to more humane methods, according to the campaign’s change.org page. BU is among the institutions that The Humane League has asked to implore Aramark to change their policies. The group is currently in the process of reaching out to student groups on campus to achieve that objective, Ford said. Nicole Maldonado, a freshman in the Questrom School of Business, said she is troubled by The Humane League’s claims, but it won’t stop her from eating chicken. “I’d appreciate the change of how they treat the chickens, but I wouldn’t change my habits,” Maldonado said. Kimberly Graham, a junior in the College of Arts and Sciences, said the university should support organizations or companies that promotes animal welfare. Each year, Dining Services conducts a student survey and compiles a sustainability report that outlines their progress and goals for the future, Riley said. Animal welfare and sustainable farming are some of the prominent goals in the 2016 Sustainability Report, Riley said. Although Aramark has provided a variety of dining and catering services to the university since 1976, BU Dining Services began to source humane-certified broiler chickens from Murray’s Chicken in 2013, Colin said. While Murray’s does not meet all of the animal-welfare goals that The Humane League would like to see, namely switching to a slower-growing breed of bird, it is a better alternative than Aramark, Ford said. However, if a student wanted to avoid eating chicken treated with cruelty, they would need to avoid eating chicken from BU Dining Services, Ford said. Aramark, on the other hand, has rejected the allegations made against them by The Humane League’s petition — Karen Cutler, the vice president of sale strategy at Aramark, wrote in an email that The Humane League is supporting this campaign because Aramark is cooperating with other nongovernmental organizations. Cutler wrote that Aramark is committed to animal welfare and sustainable sourcing practices, as shown by the company’s “industry leading policy” that addresses a range of topics, including broiler chickens. Chris Liptrot, The Humane League’s corporate relations manager, said all information in the petition is factual, and their sole motivation is to see companies appropriately address pressing animal welfare issues in a timely manner. Andreas Towers, a freshman in CAS, said that as a “fan of chicken,” although she supports animal welfare, she is afraid that it will raise the price of chicken. I’m all for Aramark being held accountable. Why isn’t anyone mentioning Perdue, Tyson, who are equally as bad???? They’re mentioned in the movie Consumed! Undercover footage on youtube. I’m always bringing in this up. Their farming is as evil as Aramark!